Happy Thanksgiving From Zippy Shell! Here come the Holidays! We here at Zippy Shell couldnÃ¢â‚¬â„¢t be more thankful for all of you! Thanks for your business, referrals, questions and curiosity. ItÃ¢â‚¬â„¢s because of you that weÃ¢â‚¬â„¢re growing fast and able to keep giving the best service in the industry! No doubt, youÃ¢â‚¬â„¢re already planning for the holiday season. The shopping ads have already begun and the snow started falling on Halloween. If the thought of what youÃ¢â‚¬â„¢re going to do with all those decorations and older items displaced by newer gifts, take a breath and remember, Zippy Shell is always here! Like Santa in reverse, we can come to your home and take your extra stuff away. We may even convince our driver, George, to wear a red nose! So, if you find yourself in need of a little post-holiday peace, give us a call! What kid doesn't love Halloween? Aside from candy and costumes, what can possibly make Halloween better? Balloons! 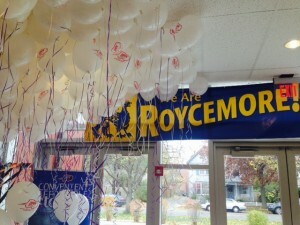 Zippy Shell was happy to dress up the annual Halloween Carnival at Roycemore School in Evanston by providing over 350 helium filled balloons for the celebration. 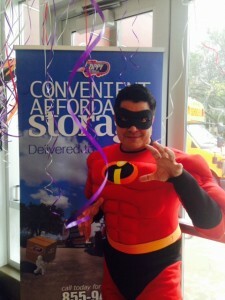 From pre-kindergarten to high school seniors, the kids got a kick out Zippy ShellÃ¢â‚¬â„¢s own Mr. Incredible (Me) passing out balloons and joining in the fun. We Can Help! We now offer full service container moves to most major cities throughout the country! 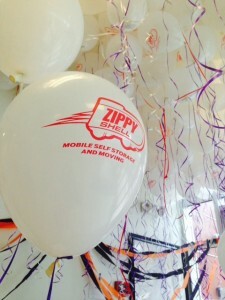 Moving with Zippy Shell is the most affordable, convenient, safe and secure way to move. No more loose items being transferred from truck to truck. No more wondering your favorite box of pillows will arrive or worrying about your guitar mysteriously disappearing. Your items are packed and secured in the shipping container (with YOUR lock) right in front of your house. Call us for a detailed door to door quote. 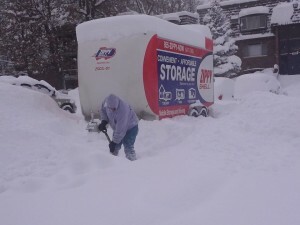 Do you have a need for winter storage? Would you like to tell us what youÃ¢â‚¬â„¢re thankful for? Want to find out how to get some hot coffee during the cold winter months? For answers to these or any of your questions, stop by ourÃ‚Â homepage or check out our Facebook page. Stay warm and see you in December!